We'll treat you like family. Dr. Staab was born and raised in South Jersey. He spent his childhood in Pine Hill, Camden County. He attended Cook College, Rutgers, and earned a BS in Environmental Chemistry. After working in the chemical and pharmaceutical industries as a Lab Chemist and then a Shift Supervisor for several years, he went back to school to pursue his Doctorate in Optometry. 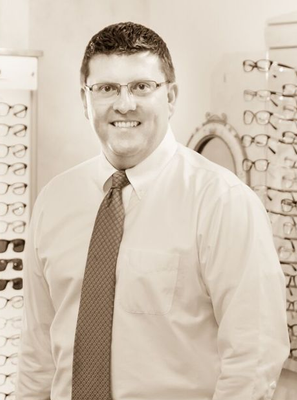 He attended The Pennsylvania College of Optometry and received the OD degree in 2005. Dr. Staab enjoys running a private practice. He strives to help his patients see their best and to keep their eyes healthy. He has a broad range of experience in Primary Eye Care and has extensive experience fitting contact lenses. He is always looking for ways to expand his knowledge in the field and wants his patients to feel educated about their vision and eye health during the examination and treatment. His special interests in eyecare are contact lenses, GVSS (Ortho-K), and Dry Eye management. Dr. Staab is Board Certified by the American Board of Optometry. Is a member of the American Optometric Association and the New Jersey Society of Optometric Physicians. When not in the office Dr. Staab is most likely spending time with his wife and daughter. He likes to assist in coaching his daughter’s teams in Marlton Sports and enjoys running into patients around town. Evesham Eye Associates welcomes Marlton Eye Associates to our family!